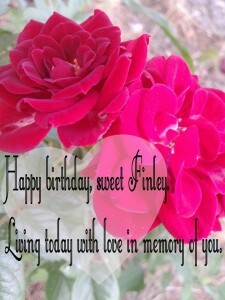 I knew this month I wanted to write about Finley’s birthday – 2nd August. This year he will be 5. 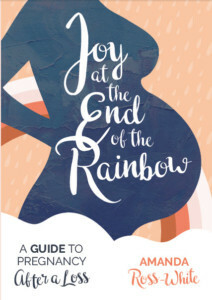 Many people wonder how they should/could/will honour the date their angel baby was born once their rainbow comes along. 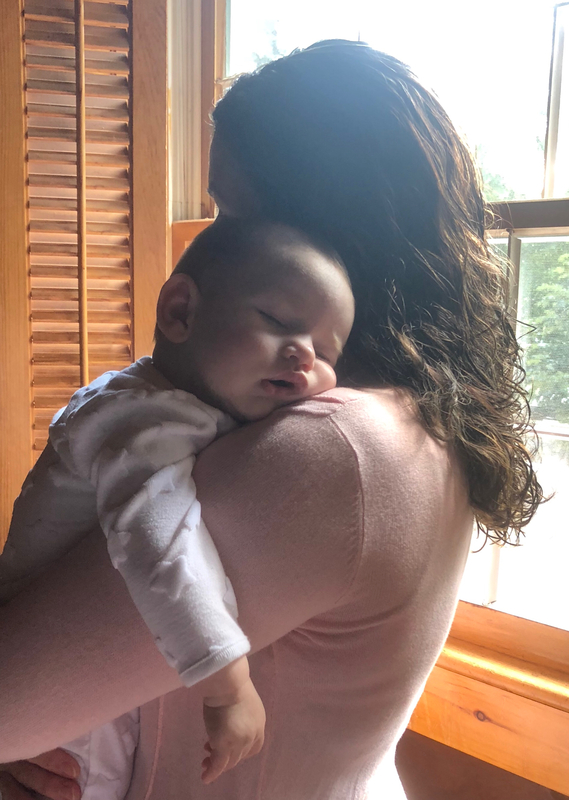 I thought I would write this month about all of Finley’s birthdays (with the exception of his actual day of birth. If you want to read this story, it is reflected within my posts on my facebook page this week, and in my book). 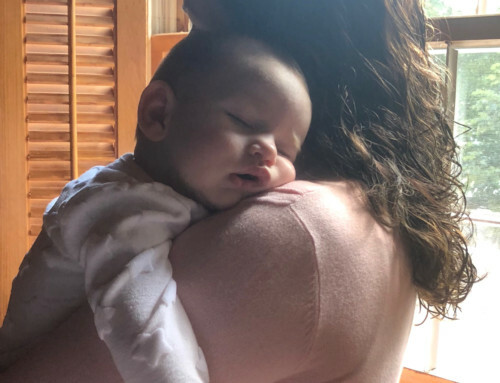 Finley’s little sister arrived 1 month and 9 days after Finley’s first birthday. 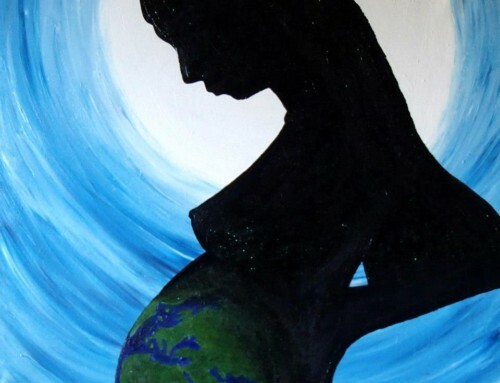 I took a look back through my pregnancy journal to see how I was feeling at the time. “I went to see the counsellor. Sometimes I struggle to find anything to talk about for an hour, but today I could not stop. I cried and cried today. I feel so sad that it is almost Finley’s first birthday. It is hard to believe it has almost been a year. I cried because I was not ready yet to get Finley’s head stone. I don’t want to cover him up. Its so final, it’s like he is getting further and further away. If we get a head stone all of a sudden there will be lots of soil, layer of concrete and then stone on top of him. 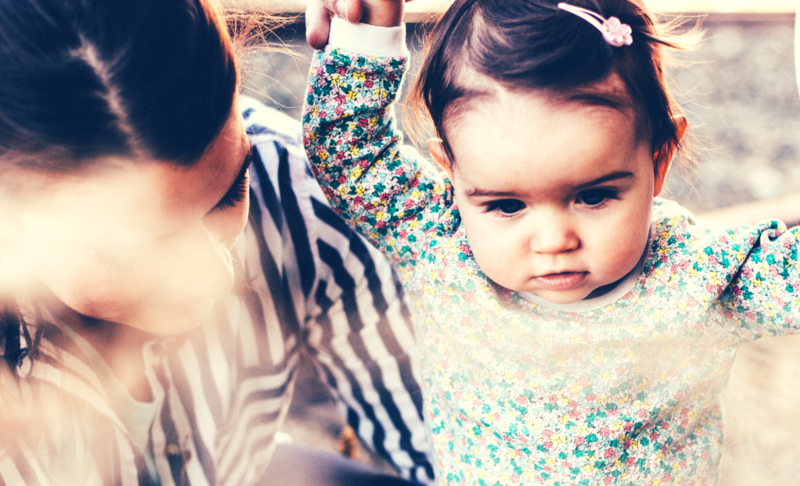 As it comes to the end of his year, it feels so hard to move into a new year with a new baby on the way. 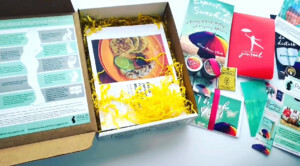 I am finding it hard to be wholly committed to this pregnancy all the time. I want to allow Finley this last part of his time in my life, before we necessarily have to let him go another notch. It is fair for him to have this time and focus, and then for Twinkle to have my time and focus. I am starting to be able to integrate both of them into my life. 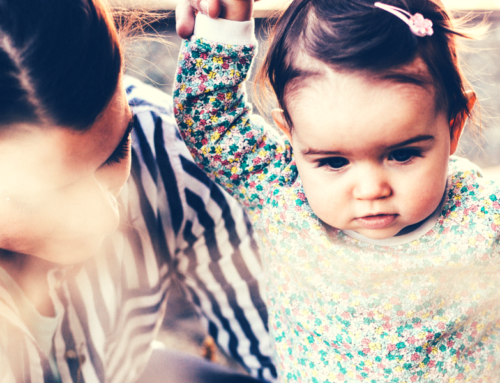 I am sure that this is a familiar worry to Mums, but I don’t feel like I can love two of them equally at the same time. 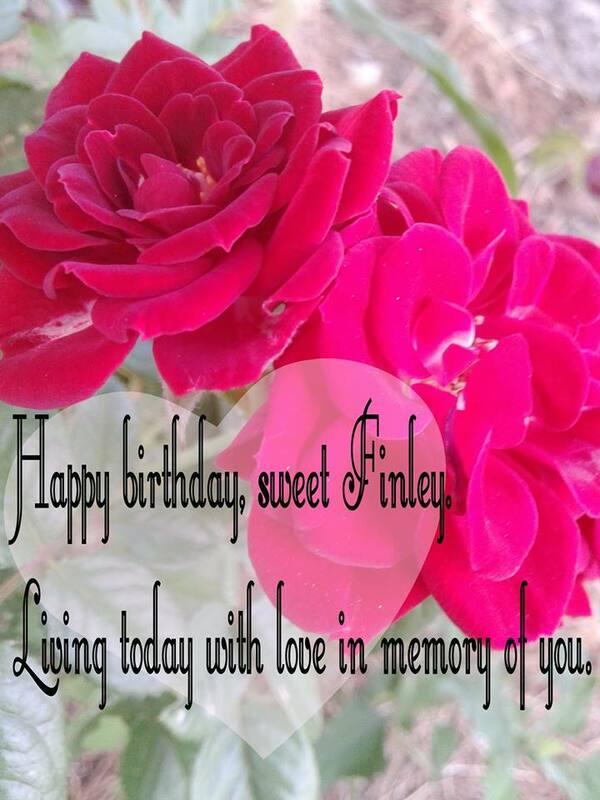 We wanted to celebrate Finley’s birthday. 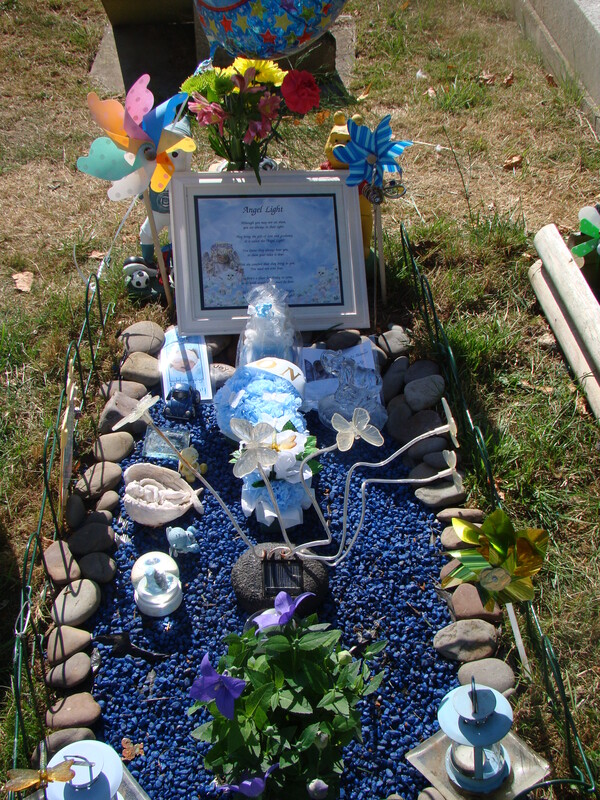 We decorated his grave, he had some new gifts from other people. Decorated for Finley’s 1st birthday. We started a new tradition of letting balloons up to the sky. 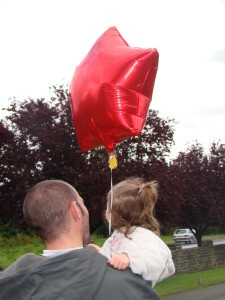 Releasing balloons with a bump. 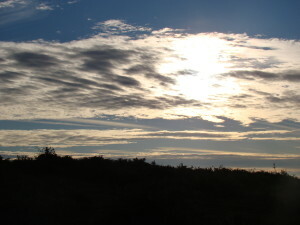 We walked up to a beautiful spot on the hills, that has always been a place we visit to reflect, think and be at peace. 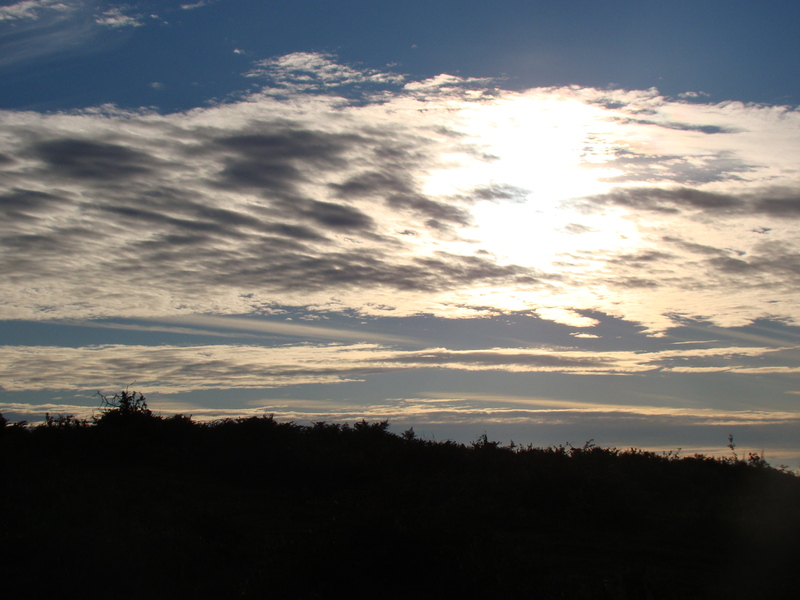 We watched the sunset on his birthday, knowing that the one thing that’s for sure, it will rise again tomorrow. 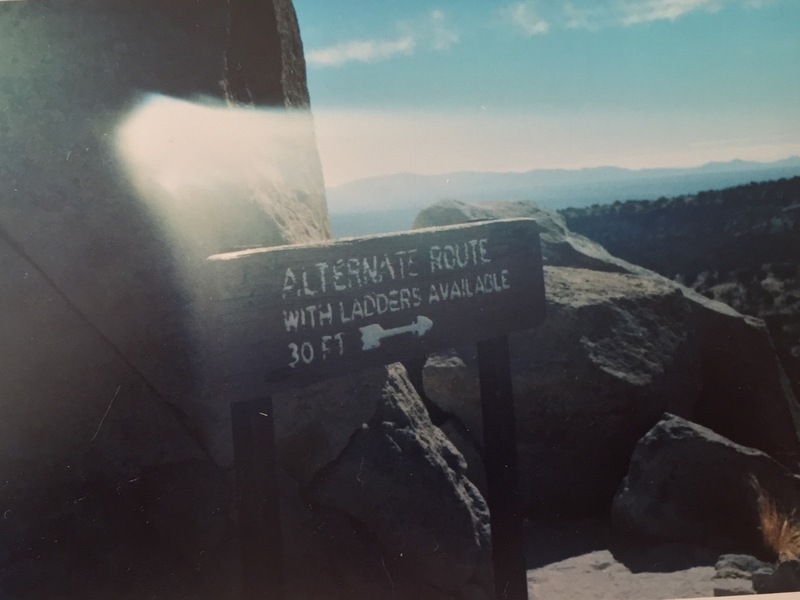 And we began to look forwards. The sunset in peaceful countryside. This birthday was the first one Twinkle joined us for, she was just under a year old. For this birthday, I’d been working in the baby loss community a while, so I invited people to help us celebrate by painting a pebble. I thought this was something that little Twinkle would like, all the colourful pebbles. It never occurred to us not to involve Twinkle in her brothers birthday. We had/have photos of him all around the house, talk about him frequently. It would not have been our way to celebrate without her. By this point, I’d realised that our sadness was not her sadness. I wanted her to know her brother, but not to be upset by his story. 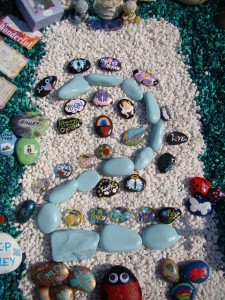 We decorated his grave with new stones, and a number 2 made from painted pebbles (hint use acrylic paint and varnish). 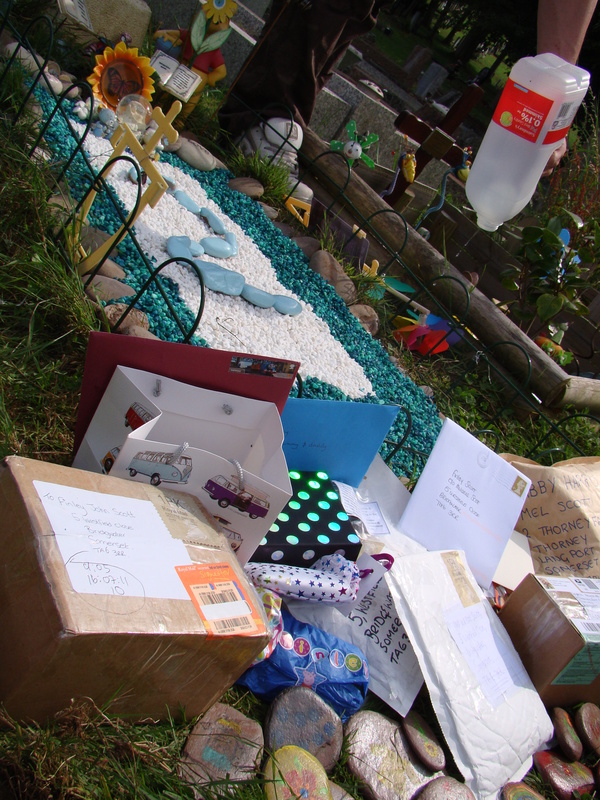 I kept all the parcels he received, and placed them at his grave the night before. I lit a candle there. 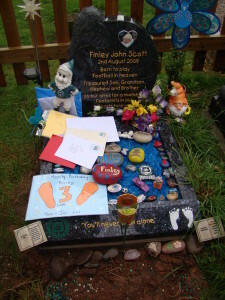 Opening presents at Finley’s grave. On his birthday I went alone, at his time of birth and opened all the presents, placing all the painted pebbles on his grave. Painted pebbles from around the worlds. I’d love to write that it gets easier but I can’t. I spend the time leading up to his birthday worrying, remembering, planning and feel very low each year. By his 3rd birthday Twinkle was growing up quickly. 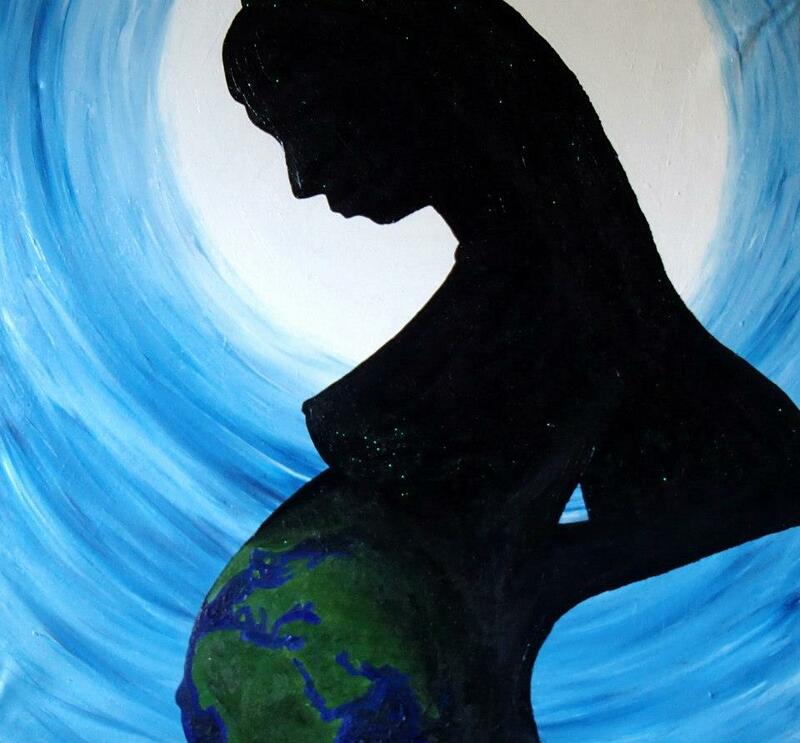 She could now sign and speak, and make choices. 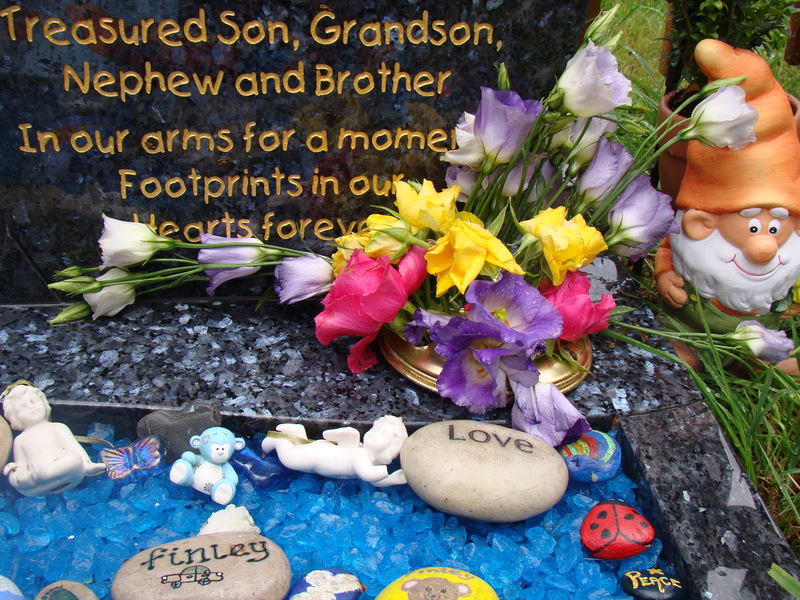 Finley’s headstone was placed just before his 3rd birthday, the perfect words and beautiful granite replacing the need for decoration. A card from his little sister on his 3rd birthday. 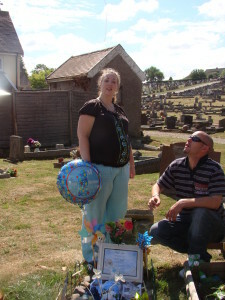 We went to his grave, with Twinkle and some balloons. I’d left his cards there the night before and she helped to open them. She also took her own card – a laminated page with her footprints on it which the childminder had made with her. Twinkle takes over the flower arranging. 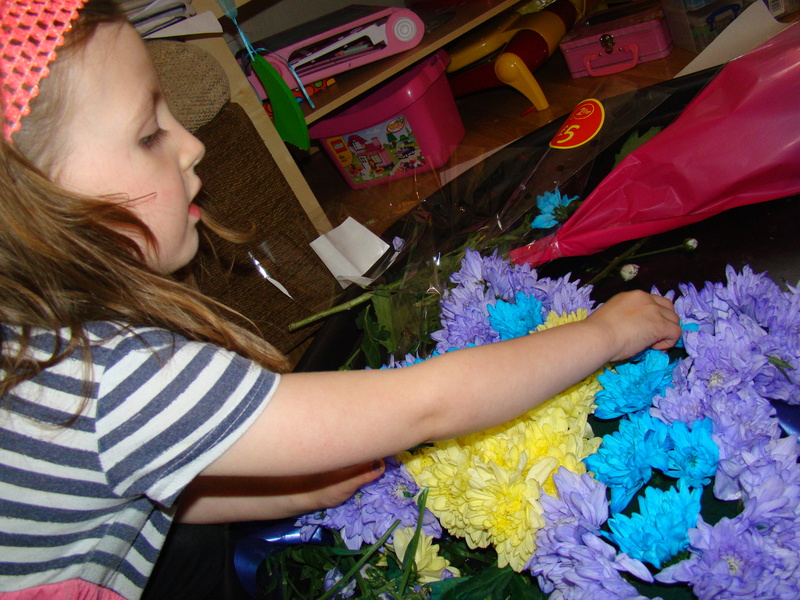 Twinkle had by now picked up the art of flower arranging, and with some help enjoyed putting them in the vase. She took responsibility for releasing the balloons. Watching the balloons go to the clouds. 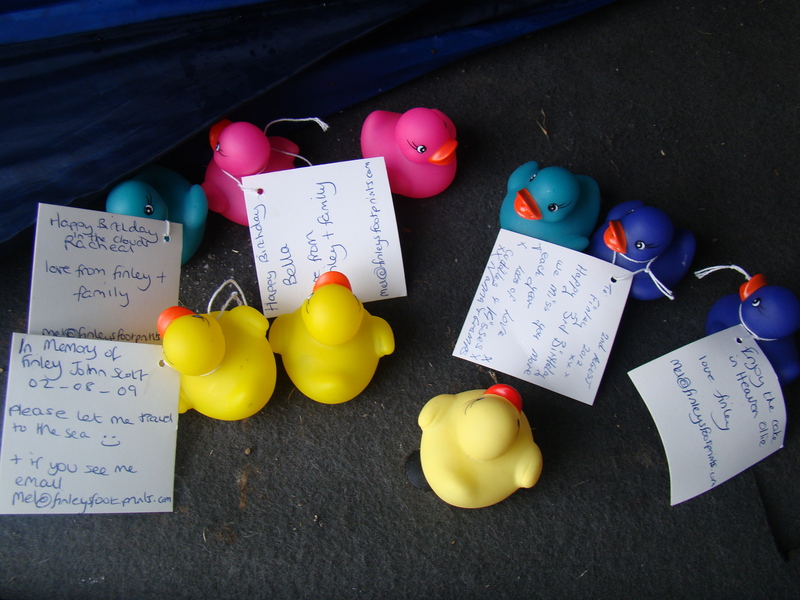 But my favourite part of this particular birthday has to be the duck race. We wrote little letters to Finley and attached them to plastic ducks. Twinkle really enjoyed releasing them to the sea. 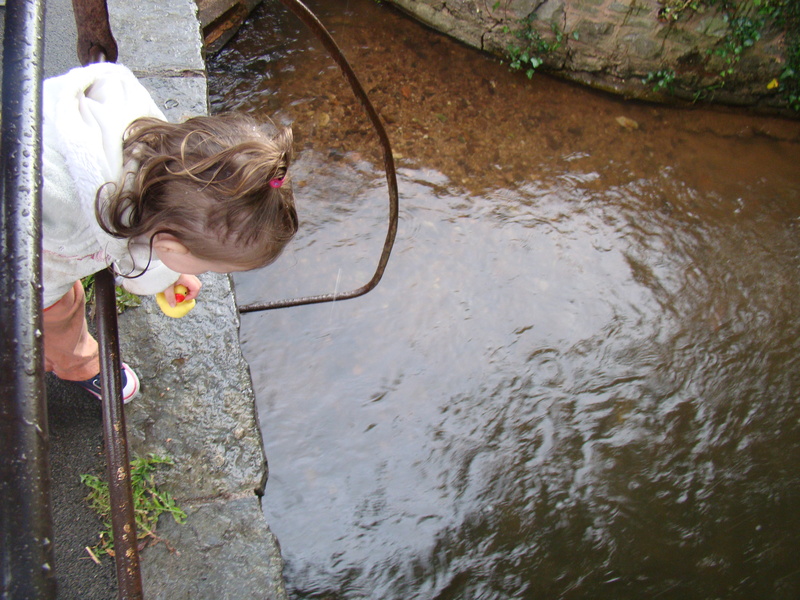 A duck race to the sea. Twinkle enjoyed this gift to Finley. Time passes so quickly. Finley’s 4th birthday was about paying it forward for me. 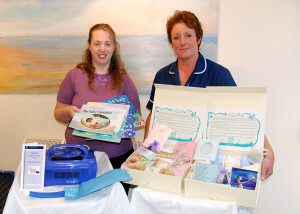 I delivered 15 Butterfly Memory Boxes to the hospital he was born at in his memory. 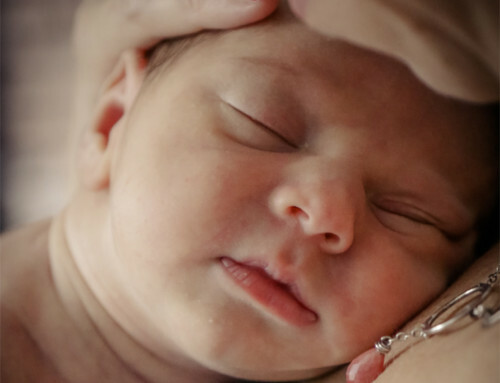 I sat and spoke with the midwife who had delivered him, and watched as with tears in her eyes she explained the impact Finley’s birth had on her and the changes that have been made as a result. 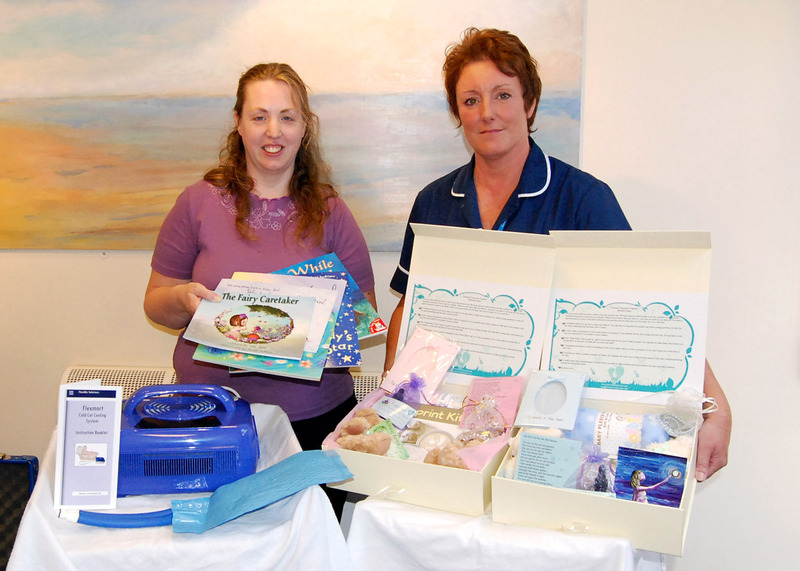 As well as the memory boxes, we also delivered a cuddle cot. And that brings us up to date. Finley’s 5th birthday. I don’t really understand time. It simultaneously feels like only yesterday and like a lifetime. I cannot believe that 5 years have passed in the blink of an eye. This year has felt so, so hard. There has been much change which has taken it’s toll on my emotional state. 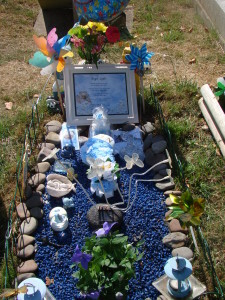 I have been running on empty in the build up to his birthday, and finally a couple of days ago cried to a friend, that I didn’t want to go to Finley’s grave. I hadn’t been going regularly as it became too painful for me. Whilst I can make excuses for not going in the busyness of day to day life, the pain I felt when I said that I couldn’t face going on his birthday was indescribable. A good chat with my friend and she offered a solution, to go but to not be alone. She and her family would come with us. This helped so much. Twinkle this year has so much more awareness. We no longer talk about going to see Finley, as I felt it had become confusing, so now we go to Finley’s grave. Each time we go it is because she has asked to go. We’ve faced more questions, including “can I go to Finley’s birthday party?” and “can Finley come down from the clouds for his balloons?”. I decided this year to make Finley some flowers in the shape of a Butterfly. This was something Twinkle enjoyed doing with me. 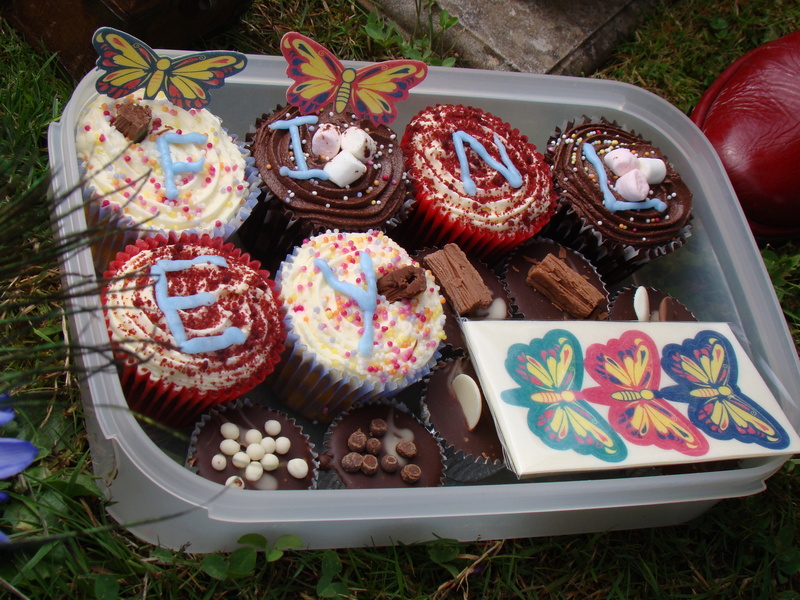 We had cupcakes at Finley’s grave which my friend brought and she had each person add a candle and blow it out sending a wish up to Finley with the smoke. 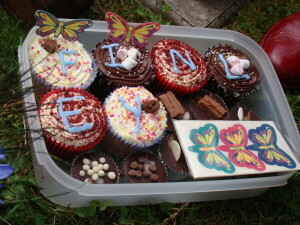 This birthday was also about allowing people to raise my spirits… I invited them to join in with a #footprintforfinley. A random act of kindness completed conciously in his memory. And I have popped on and off twitter and facebook to read about them. The beautiful words people have left me and the things people have done in his memory have helped bring a smile to my face. As with parenting after a loss in general, birthdays are a balance of life and death. A time to reflect, a time to be present. A bittersweet moment of family life.